Hello! While I'm in Illinois, I'm lucky enough to have a few of my beautiful friends filling in for me. First up is my dear friend Erica, who I'm sure you've familiar with if you've been following along for a while. I've always referred to Erica as my "blogger friend," but that's really not true anymore. While we met through blogging a few years back, she's now my homegirl in real life. She is so much fun to hang out with, and I've wanted to steal her entire closet since I met her. I'm sure you all feel the same way. 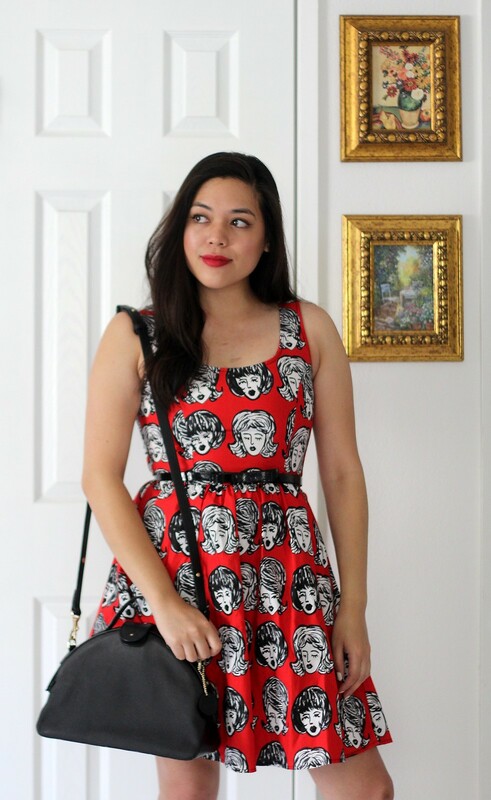 Keep reading to learn about how Erica and I found this seriously amazing dress. Hey everyone! 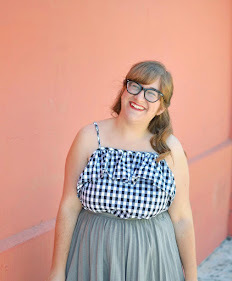 I'm Erica, occasional style/beauty blogger over at Sweets and Hearts. If you've been following Elana for a while, you might recognize me from the swap blog we were both a part of, Flock Together (aww, good times). We used to borrow each other's clothes. And I'm sure we'd still be into it if we weren't as lazy. Oops. Well, now we hang out IRL. Elana's off doing something SUPER FUN (lucky! ), so it's pretty awesome that she's letting me take over for the day (thanks, Elana)! 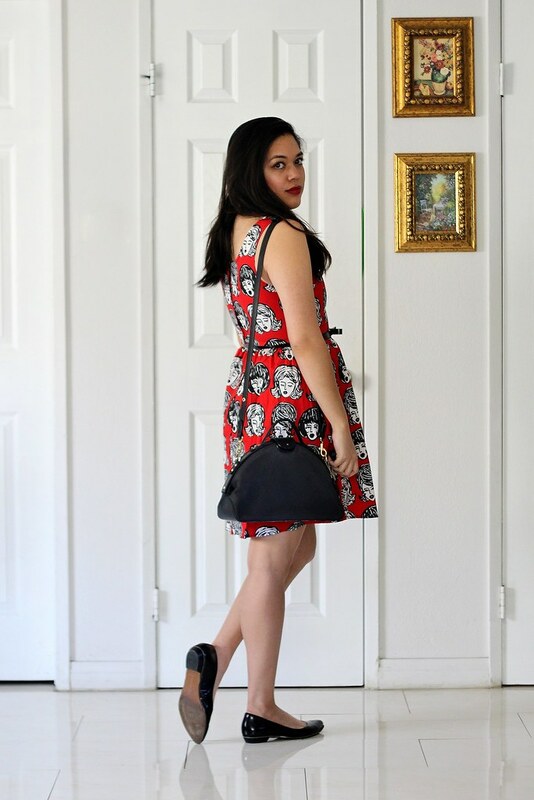 But anyway, it's been quite a while since I've done a proper outfit post, so I thought it would be nice to share the dress I bought the last time I hung out with her, which was at the Dapper Day Expo a few months ago. We...bought things. We were easily swayed. We were weak. There were too many pretty things. Can you blame us? We lingered a little too long at the Retrolicious booth and gave in a little too easily. We got a good deal though (really!) and I have no regrets (here's the lovely dress Elana ended up getting). I just couldn't resist the 60's hairstyle doodles (AND IT HAS POCKETS). Elana's one of the funnest/funniest people I've met and her enthusiasm is extremely contagious. We both get excited over the same things--including shopping--so it's probably not a good idea to shop with us because we'll just enable you (but you're totally welcome to...we'll even take your outfit photos for you). HUGE thanks to Elana for letting me ramble and post a few photos! If you want, you can follow me on Instagram @sweetsandhearts, or feel free to check out my blog. Hope you have a wonderful day! 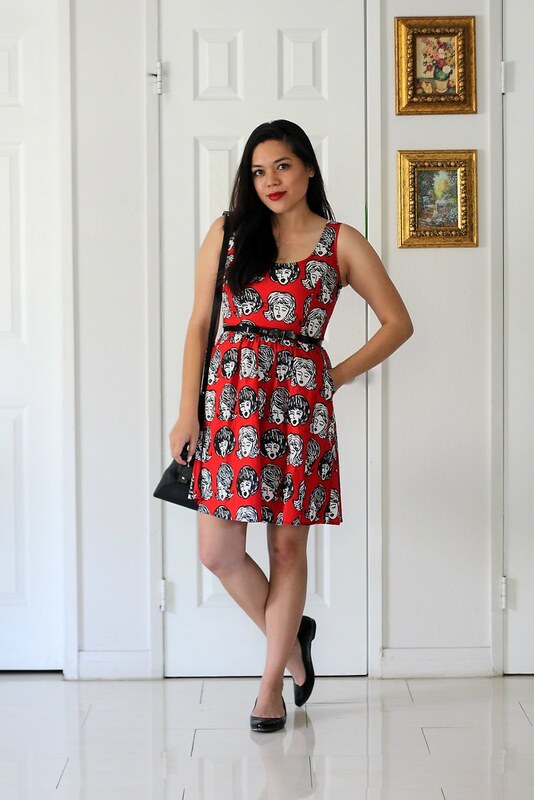 Uh yeah, the print on this dress is amazing! Definitely worth it!